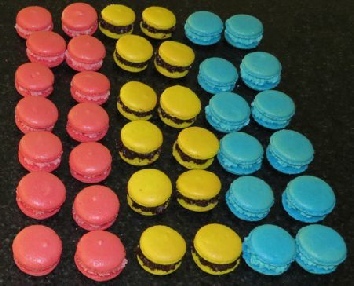 You will need baking trays with parchment to line or macaron silicone mats. Colouring or flavour of choice. Your macarons can also be filled with jam or perhaps a chocolate ganache. 1. Line your baking trays with parchment and mark out circles on about 3.5 cms in diameter and evenly spaced or, use your silicone mat (available from Lakeland). 2. Sieve the icing sugar and ground almonds together and then sieve the whole lot again, these need to be very fine otherwise you will get a 'grainy' looking top to your macaron. 3. Whisk the egg whites until you get fairly stiff peaks and beat in the sugar until the mixture is thick and glossy. At this stage add any colouring or flavour you may be using and beat in. 4. Fold in the icing sugar and almond mix and stir briskly until you have a soft dropping consistency, if it is as runny as a batter you have gone too far and it cannot be rescued! The mixture should also look shiny. 5. Fit a piping bag with a small round pipe (about ¼ inch across) and fill with your mixture. 6. Pipe on to your circles keeping them all the same size in height. 7. Gently tap the tray on a hard surface to dispel any air bubbles and then leave them to dry and form a skin. This can take anything from 20 mins to 1 hour! 8. Bake for 8 - 9 minutes and then open the oven door to dispel any steam. Close again and bake for a further 9 minutes until firm and risen. You should also see little 'feet' around the bottom of your macaron which is where the mixture looks 'wrinkly'! 9. Cool completely on your trays and then remove to a cooling rack. 10. To make the butter cream soften the butter and whisk until creamy. Add the sieved icing sugar and vanilla and incorporate by whisking. You could colour at this stage if you wanted to. 11. Sandwich the macarons together with the butter cream (I like to pipe it on) and serve. N.B. These make wonderful gifts placed in a pretty box!